As the bejeweled women around me became consumed in the healing power of Arabic prayer at a Chicago area mosque, I felt only suffocation. I choked from the silence I experience when I enter a mosque, for, unlike those who were taught Muslim languages and traditions by their parents, I cannot understand any of the prayers. Sitting on the cold, carpeted floor of the mosque, I looked across the devout room to the male section, where my father kneeled in prayer. As our religion dictates, my father should have taught me the Hindi and Urdu languages and Muslim religious traditions. However, that didn’t happen and my father has not spoken to me for about four years. He doesnâ€™t speak to my older sister, Tahira, either. The space between my father and me at the mosque is an understated metaphor for the gap he imposed between us during most of my childhood. Unlike most Muslims, who view Islamic mosque visits as an opportunity to bring families closer together, my father continues the silent treatment. I am now 19 years old and my father and I have not had a real conversation since my sophomore year in high school. Although we never had a conversation where I could openly express my opinion, sophomore year made it even more difficult to achieve because my father discovered I had a boyfriend. To my father and many other Muslims, dating is seen as an indecent and immoral act for women, especially if they choose to date from other races. My boyfriend was Mexican. Despite his silent treatment, my sisters agreed to go to the mosque with my father this past summer in order to see the Indian relatives he previously did not allow or encourage us to visit. We drove together for at least an hour without any conversation, which is often preferable to endless arguments. Originally from what is now called Mumbai, India, he is one of six children, all of whom can attest to his tempestuous mood swings and the volatile anger he was prone to ever since he was a child. I do not know almost anything about his early life before immigrating to America. All I know is he worked in the Indian printing industry, became a busboy once he arrived in the United States, and later moved to Chicago around 1987. He met my German mother, Elaine, on a train and after three months of casual dating, the pair got married. When she looks back on this period of her life, my mother says she does not know why she wanted to marry my father. The two reasons she often cites are she wanted a husband in order to have children, and my father resembled Omar Sharif when he was younger. Both arguments weren’t convincing t me even as a child, and reinforced my motherâ€™s low self-esteem as a young woman. Since she did not think she could find a better man, she settled for my father, who has only served to destroy her self-esteem even more through his constant storm of insults and arguments. 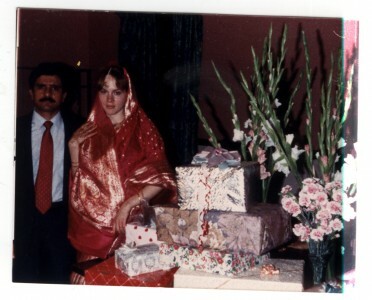 Their wedding photos show my father, dressed in a suit as obsidian black as his beard, leading my alabaster-skinned mother down a dark aisle, her rose-petal sari flowing behind her feet. To me, this moment is only one of the few shards of time where his traditions and her Western-influenced opinions interwove. Most of the time, their marriage has consisted of a constant battle between modernity and heritage. My mother believes in independence and the fulfillment of personal goals. My father clings to tradition, which, in my case, means I am to never have any sort of sexual desires until Iâ€™m married and I would obey his commands unconditionally. These clashes occurred in almost every aspect of our daily lives. When my sisters and I were young and my mother wanted to sign us up for ballet lessons, my father refused to pay for them. He said the leotards and tutus were indecent for girls to wear. Shopping trips were also a nightmare before I asserted my own will over my wardrobe. My fatherâ€™s goal was to dress me in oversized shirts and ankle-length skirts because anything that remotely clung to the skin was â€œimmoral.â€ When we shopped together, my mother had no choice but to agree with his choices. While in the mosque this summer, my mind rarely wandered to the higher celestial being my father worships but doesn’t emulate. Instead, as I tried to keep up with a service in a language foreign to my own mouth, I thought of my family. I thought of how my father and his religion and culture have not led to holiness or peace. They have led to arguments, black eyes, hospital visits for domestic violence injuries, broken eyeglasses, a nosebleed and fear. Mostly fear. Once my sister and I became teenagers, we got into more and more arguments with my father. Most of the fights were over our boyfriends, and mine were especially insulting because they were not Muslim or Indian. They were Mexican, African-American and Puerto Rican. We refused to obey what we regarded as irrational, insane and insensitive commands. Sister by sister, he stopped talking to us. Out of the three sisters in my family, he now only talks to the youngest, Zahra, because she has never had a boyfriend. Remembering the mosque visit this summer leaves me with a sense of melancholy. Itâ€™s the same sadness that emerges whenever I tell someone Iâ€™m half-Indian. This melancholy exists because even though I claim to be half-Indian, I am the only one who knows I was brought up in a culture that I am proud of but of which know nothing. My father failed to teach me about my culture because he thought I failed as a Muslim and a daughter. Still, I am glad I am split between two cultures. It has taught me to be more understanding of cultures different from my own, and to not use skin color as a method of identification. It has showed me that even when one comes from something loveless and heartbreaking, one can still emerge faithful in humanityâ€™s ability to love and to change.